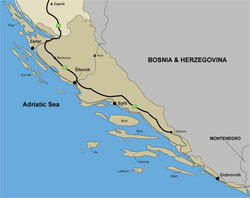 The wines of Croatia have oft been misunderstood or even disregarded. People tend to want to believe that the best wines only exist in France, Italy, Spain, and California. But naturally, anyone who starts to scratch at the skin of the global wine trade finds that it is made in a great many places throughout the world, with what seem like new regions establishing themselves every year. So where is Dalmatia? It is the area that covers most of the coast and islands of Croatia, a country that once was part of Yugoslavia throughout most of the 20th century. For those familiar with the born of the ashes, vacation hotspot of Dubrovnik, it sits at the very bottom of Dalmatia, bordering Montenegro. Is the wine there really any good? Yes! A great deal of the wine is at such a caliber that has been attracting attention from importers and gaining recognition outside the region. The small production “craft” wines that were a bargain just a few years ago, while available in more markets worldwide, are getting harder to buy as they sell out faster and faster. Despite the appearance of blaring, barroque gold labels, and websites not updated since 1995, these are some of the best European wines being made today. Local grape varietals include: Babić, Bogdanuša, Crljenak Kaštelanski, Debit, Drnekuša, Grk, Lasina, Malvasia, Maraština, Plavac Mali, Plavina, Pošip, Trbljan, and Vugava to name a few. Please peruse more articles about the wines of Dalmatia.